Constantine was born & raised in Athens, Greece. At the age of 12, he began learning to play the guitar by copying songs from his record collection of his favorite bands such as Iron Maiden, Metallica, Slayer, Megadeth, Judas Priest & Exodus. As a young teenager, he soon started to evolve more on his study & approach on the guitar by getting influenced from guitar heroes like Joe Satriani, Steve Vai, Yngwie Malmsteen, Marty Friedman, Michael Romeo & Zakk Wylde. 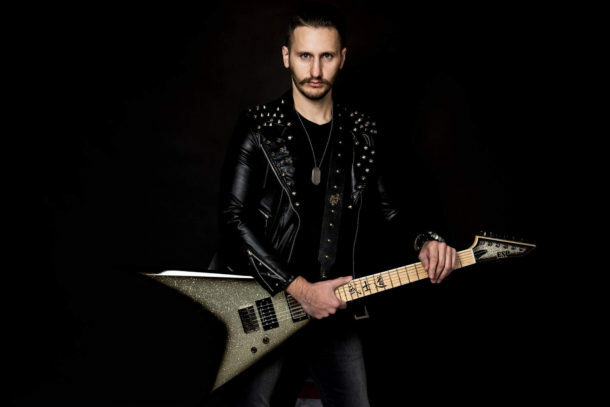 Constantine’s playing over the years has evolved & ranges from shredding riffs to soaring solos with memorable twin guitar melodic harmonies, fluid tapping-arpeggio lines, wide vibrato, and melodic pentatonics. Despite the young of his age, time and work had proved that Constantine’s flexibility is undoubted both in performances but in compositions in different genres/styles of music. Constantine’s efforts over the years have taken many forms including playing in Nightrage (2007), Descending (2008-2012), Mystic Prophecy (2008-2012), Nightfall (2010-2013), Primal Fear (2012). His first solo album ‘Shredcore’ was released in 2010 and the follow-up ‘Aftermath’ will be released in May of 2019.